It’s Teacher Appreciation Day at my daughter’s school today, and ever since I found out her teacher is vegan I’ve wanted to whip up some tasty sweets for the fearless leader of her classroom. Now, I had the perfect excuse. In addition to the Grain- and Dairy-Free Breakfast Bars I wrote about in October, I decided to make these Grain-Free Peanut Butter Chocolate Chip Cookies. A cookie that’s sweet and savory—is there a better combination? Plus, I like that you get a nice punch of protein from the peanut butter, making it almost good for you. With the grain-free recipe, you lose the flour and pack in even more protein from almond and peanut flour. I first made these cookies last week when I found the recipe on Elana’s Pantry. If you’re on a gluten- or grain-free diet, you should bookmark the site. Elana has come up with some amazing gluten-free recipes for baked goods. Almost always, they’re tasty and straightforward. Last time, I made the cookies with butter (even though Elana’s recipe is vegan and called for vegan palm oil shortening)and added the chocolate chips. The kids loved, loved it! And so did I. This time, I substituted coconut oil to make it vegan for S’s teacher. They’re just as scrumptious, and the kids couldn’t tell the difference. With just 1/4 cup honey, 2 TB of butter or coconut oil and gluten-free, I’ve decided they’re healthy enough to serve as a mid-day and after-school snack. After the kids descended on these cookies, I was afraid there wouldn’t be enough left for S’s teacher. Try them, try them and you will see! 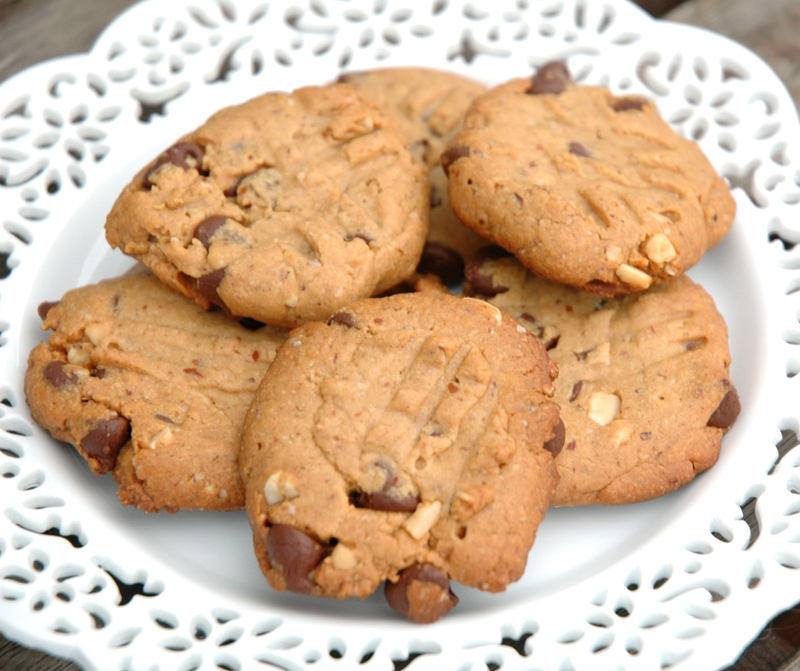 ** If your child has a peanut allergy, consider making these with almond butter or sunflower seed butter. Makes 12 – 16 cookies. 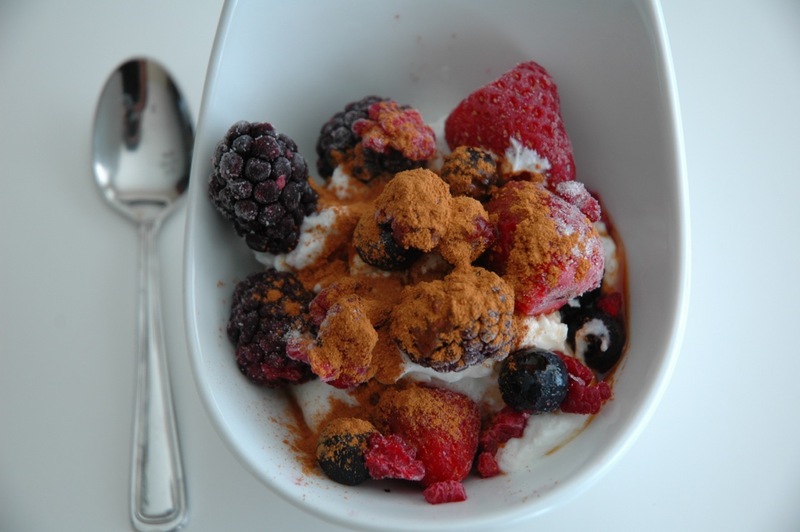 In a small bowl, combine dry ingredients: almond/peanut flour, salt and baking soda. In a medium bowl, mix together wet ingredients (peanut butter, honey, coconut oil and vanilla extract) with a hand blender. Blend dry ingredient into wet until well combined. Scoop dough 1 TB at a time onto a parchment-lined baking sheet. Bake for 6 – 12 minutes until golden brown around the edges. 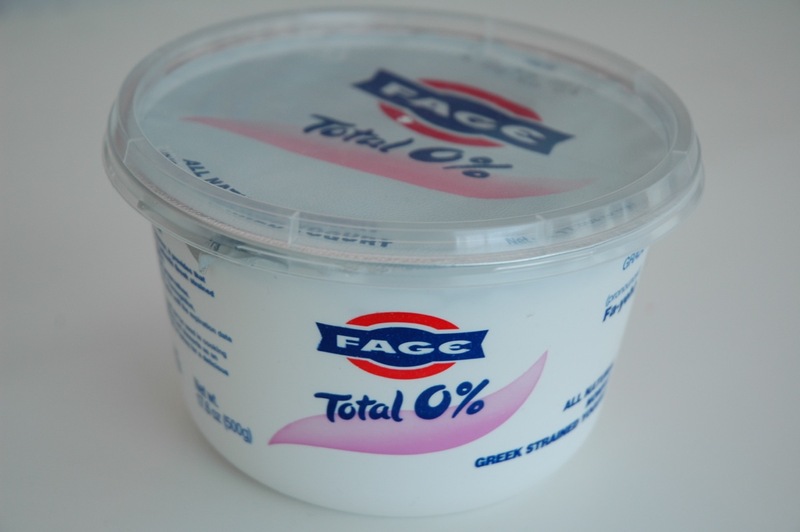 First, you start with 0% Greek yogurt. Regardless of the fat content, it’s creamy, dreamy goodness. 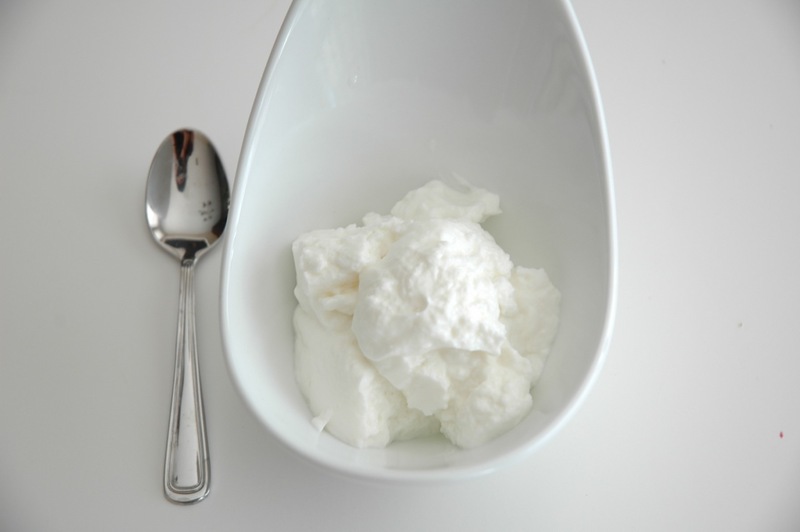 Your gut will applaud you for bringing in all that good “probiotic” bacteria. 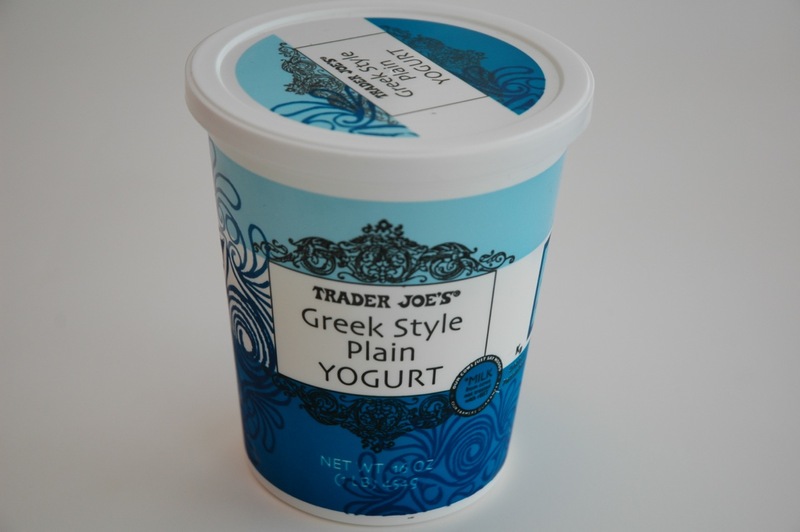 Or, if you want to go with the full-fat version, try this (Fage’s whole-milk version is tasty, too, but I didn’t have it in my fridge). 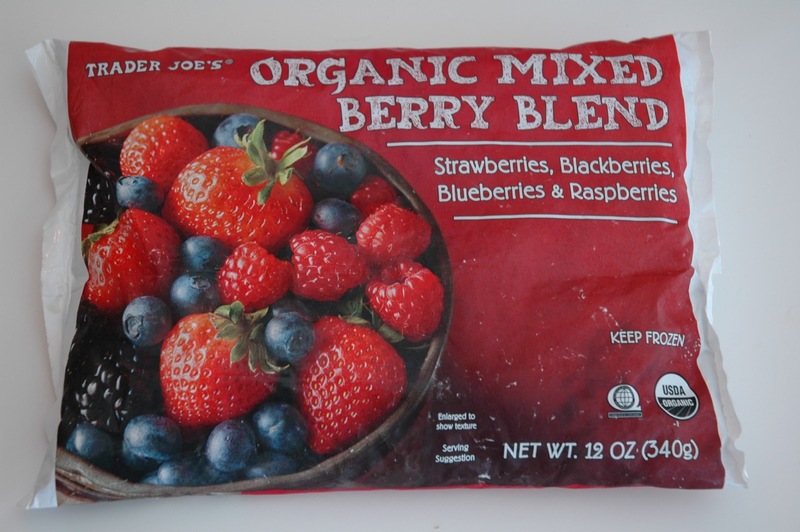 Then, add a handful of frozen berries. 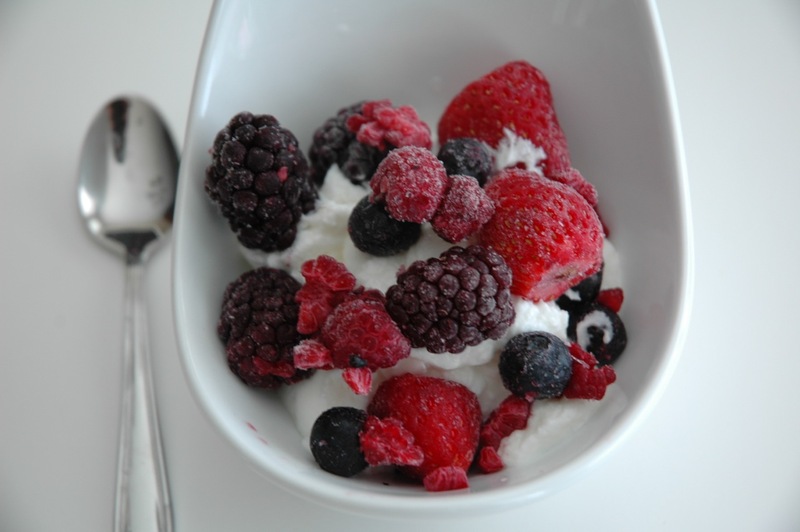 If you haven’t heard, berries are chock full of super-healthy antioxidants that fight disease. 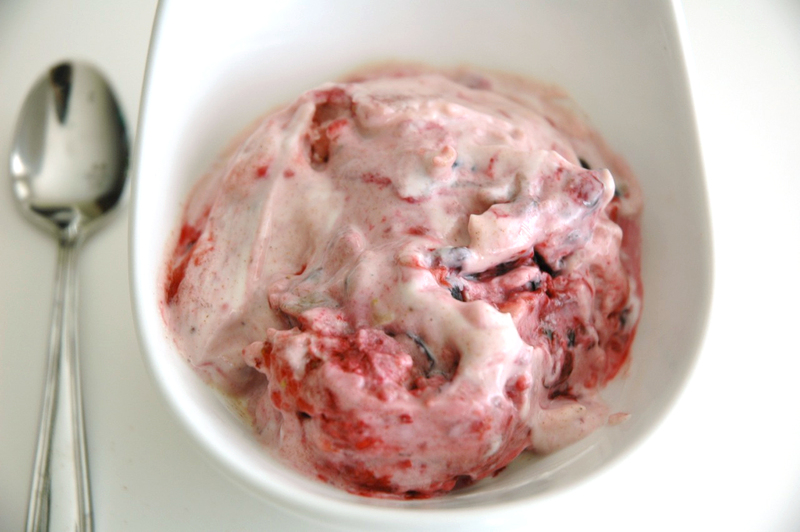 I like the frozen variety for this “dessert,” because it really helps give it an ice cream-like consistency. However, fresh berries would work just fine. 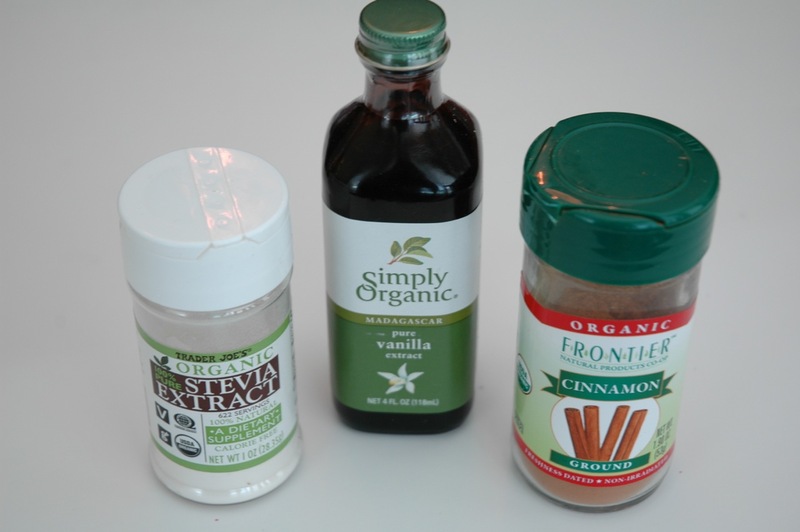 Lastly, spice and sweeten things up with cinnamon, vanilla extract and a tiny scoop of Stevia. Or, you could use a teaspoon of honey. The Stevia keeps the sugar content—and the guilt—really low. Take your metal spoon and start stirring and pounding it all together. If you have some early-morning stress, this is a good time to get it out. Smoosh and smash and mix it all up, the same way they do at Cold Stone Creamery when they add your mix-ins. After your first bite, all those cravings for Pinkberry and Red Mango will be banished for good. Now, close the door, sit down and have a moment to yourself. It’s better than Calgon. I promise. 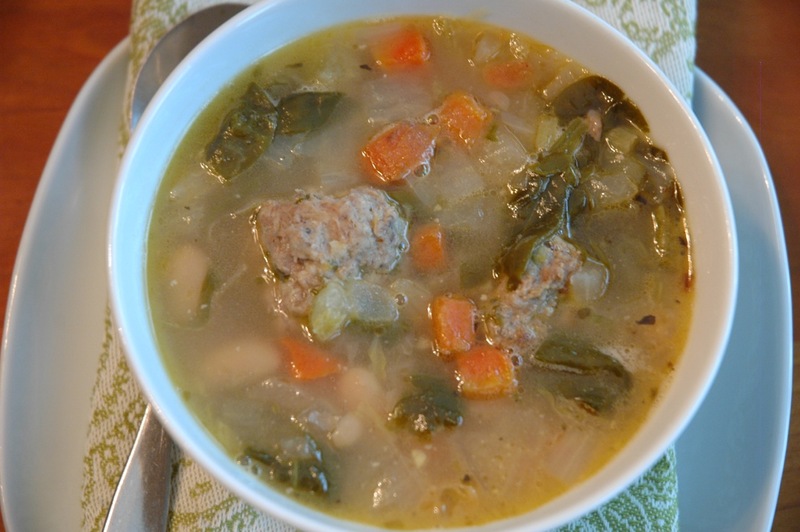 I’ve always loved a piping-hot bowl of Italian Wedding Soup, but I had never found the right recipe. Until now. I scoured the Web and combined a little bit of this one with a little bit of that one, added a few more vegetables and voila—it was perfection. Everyone had seconds and asked me to make it again. I started by sauteeing a container of mirepoix from Trader Joe’s, which is basically chopped carrots, onions and celery, in olive oil. Pre-chopped vegetables for a good stock is just what I needed on a rushed day. Then, I added 8 cups of low-sodium chicken broth, plus 1 can of cannellini beans and a the heel of a wedge of Parmesan cheese. I let it simmer for a about 15 minutes and then I added the meatballs. I shaped them into mini meatballs and dropped them into the simmering broth until they were cooked through. Lastly, I turned off the heat and stirred in a bag of baby spinach. You could substitute endive or Swiss chard, but you’d have to increase your cooking time. Serve with freshly grated Parmesan cheese and season with salt and pepper. Would You Let Your Child Pack Her Own Lunch? Last night, I got too involved with Katniss and Peeta. It was past midnight and I was still trying to figure out if there was any way they would both make it out of the Quarter Quell alive. Yep, I’m talking about the second book of the Hunger Games trilogy. As a result, I didn’t get out of bed until 6 this morning. When I stumbled down the stairs, I found S packing her own lunch. A first, for sure. 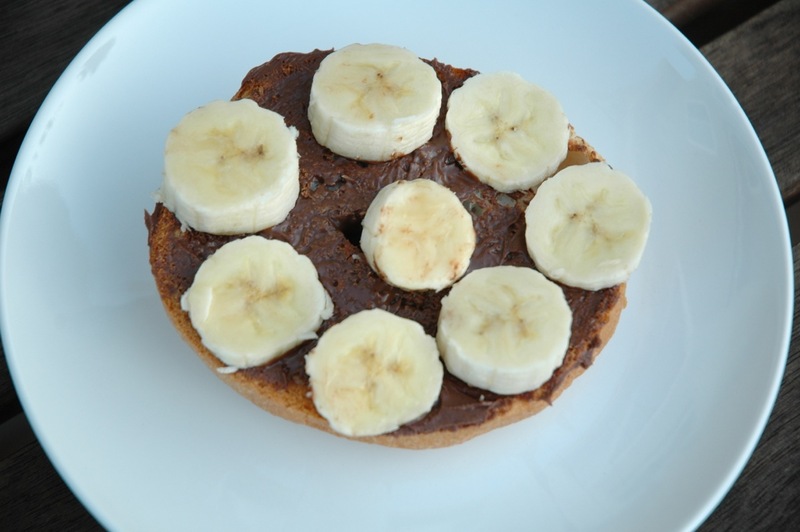 A gluten-free bagel with Trader Joe’s Cocoa Almond Spread (It’s basically Nutella, but made with almonds instead of hazelnuts.) and bananas. That’s almost healthy, right? Gluten-free and with fruit? LOL. To her credit, she also packed a pear, a granola bar and water. It’s certainly not the lunch I would have made for her, but she saved me the trouble of packing a lunch. For that, she got a big hug and the right to eat what she made. Had I known I didn’t have to make lunch, I would’ve kept sleeping. Here’s the funny part: when I picked her up from school this afternoon, she told me the chocolate spread and bagel “tasted rotten.” After one bite, she decided to eat only the bananas. I was so floored I almost drove off the road. Now that Nutella sandwiches are off her radar, I clearly need to come up with some sort of arrangement with her so I can sleep in while she makes her own lunch. At least until I’m done with the Hunger Games trilogy. Would you let your child eat whatever he/she packed for lunch? 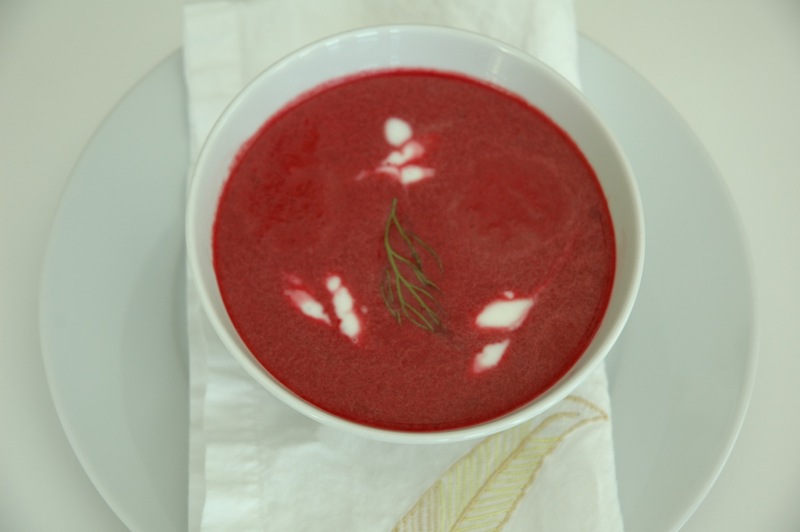 I quickly Google “beet and fennel” and this beautiful soup from Epicurious pops up. I’m sold. Plus, I know I need to detox after a week of chicken and duck pate, delectable macarons in every flavor imaginable, homemade Nutter Butters from the famous Bouchon Bakery and potstickers from a hole-in-the-wall in Chinatown. Not to mention: too many glasses of wine. I start chopping an onion, and dicing the beets and fennel bulb into 1/2-inch cubes. Since I’m almost drowning in root vegetables, I decide to double the recipe and make 8 cups of soup. First, I sauté the onions, fennel and fennel seeds in olive oil. After 5 to 8 minutes, I add the beets and low-sodium chicken broth. It all simmers for 20 minutes in a covered pot. Now that the beets are tender, I drop in my immersion blender and let it do its magic. Ahhh, puree perfection. Lastly, I whisk in some unflavored kefir and season the pink soup with a little salt and pepper. Not only is the soup the prettiest I’ve ever made, it’s also delicious. It has just the right amount of tang, thanks to the kefir, and it ends with a nice licorice note because of the fennel. I have two bowls for lunch and C licks his bowl clean, telling me he also wants it for dinner. How could I not oblige? But truth be told: S turned her nose up at it after a few spoonfuls. Even after doubling the recipe, I still have two fennel bulbs and eight beets in my fridge. I see more pink soup in my future. I know it’s been a good long while since I’ve posted, so I wanted to start back up with something fun. 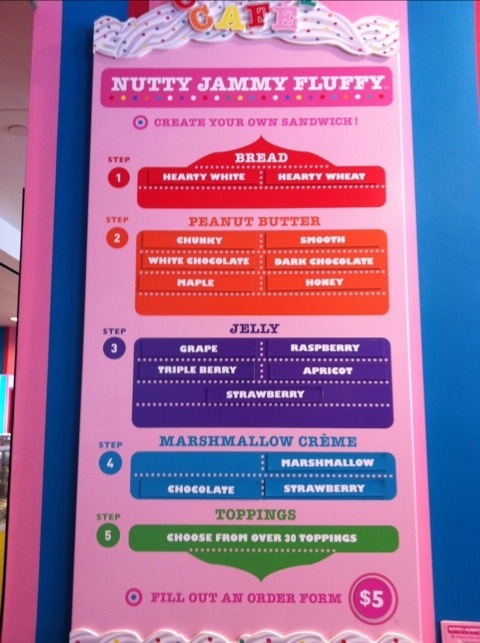 I’m in New York City this week and came across some sweet sandwich ideas at the much ballyhooed Dylan’s Candy Bar. Check out this menu and let me know if you’d try any of these at home.